On July 2, in the afternoon, the Okinawa Prefectural Assembly members resolved to protest against the LDP lawmakers' attack on local media and defamation of Okinawan people. Liberal-Democratic Party (LDP) lawmakers close to Prime Minister Shinzo Abe held a meeting, in which members advocated punishing news media, including two major Okinawan newspapers. On July 2, in the afternoon, the Okinawa Prefectural Assembly members resolved to protest against the remarks attacking media and defaming Okinawan people. The resolution was proposed by ruling parties in the assembly. It is directed at Shinzo Abe, the prime minister and Liberal Democratic Party president. The assembly members of the Okinawa branch of the LDP, which is an opposition party in the local assembly, also filed a resolution to call on those who made the remarks, to reflect on what they had said. Okinawa LDP assembly members have said the comments were inappropriate. However, the Okinawa Prefectural Assembly killed the resolution owing to the seconders being in a minority. The assembly members of the ruling parties pointed out that these remarks were made at a study session held by LDP lawmakers. The Okinawa Prefectural Assembly needs to protest against Prime Minister Abe, who is responsible for what his party members said. 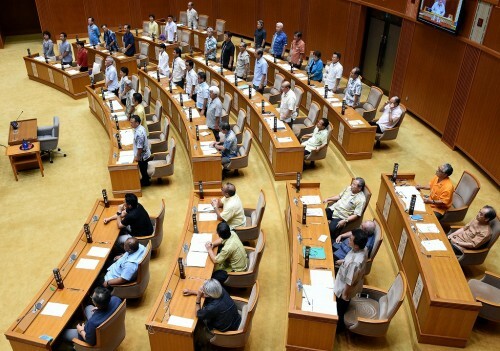 Those belonging to the Okinawa branch of the LDP claimed the assembly did not need to protest against Abe because the study session was held in a voluntary manner. While 31 members including neutral and independent members, and members from the ruling parties, voted for the resolution, 13 LDP members were against it. Two members were absent when the assembly took a vote on the resolution. While 13 LDP members voted for the resolution proposed by the LDP, other 31 assembly members were against it.